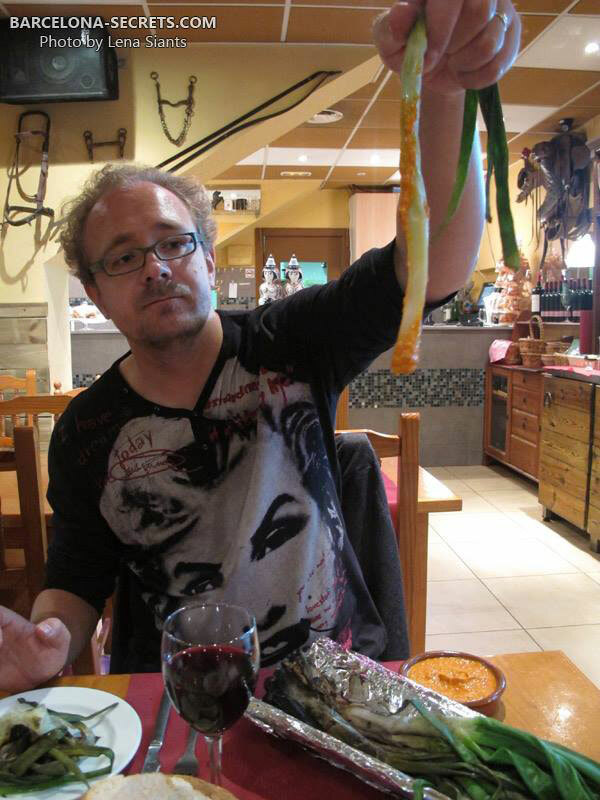 Calçotada is definitely one of the most outstanding things in Catalan traditional cuisine, something not to be missed if you visit Catalonia in winter and consider yourself a foodie. Calçot is something similar to a giant spring onion which is only available in winter and early spring. It is usually cooked on barbecue grill and consumed as a starter, followed by a selection of grilled meats and sausages, washed down with red wine. The grilled onion has fire-burned outer layer, so in order to eat it you must first pull it away to reveal a juicy white baked core, which is later dipped into romesco sauce, made of almonds, sweet red peppers and olive oil. Believe it or not, but it tastes really good, even if you don’t like onion at all! Not many restaurants in Barcelona serve calçots barbecue today, this is why it is very typical for Bacelonans to escape to the countryside with their family or friends at least once or twice a year, in order to enjoy this meal in one of the traditional rural taverns. 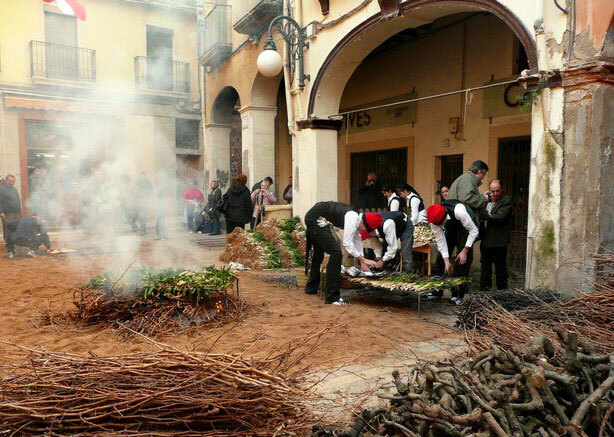 If you want to experience the Calçotada at its best, don’t miss the festival of the Calçotada (La Festa de la Calçotada), which is usually held on the last Sunday of January in the town of Valls (Tarragona province). 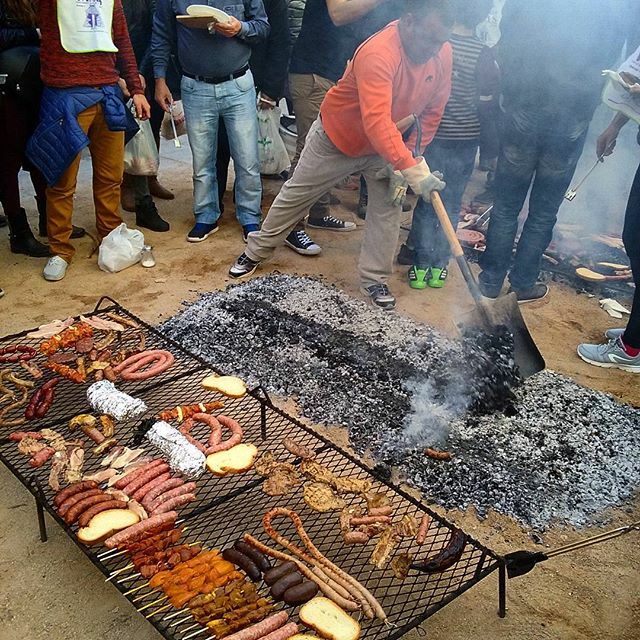 This gastronomical festivity gathers in Valls thousands of people from all across Catalonia. Dont’ forget to bring there some meat and vegetables – you’ll be able to grill them on one of the huge barbecues together with other visitors of this amazing event. In Barcelona Secrets, we love Catalan food traditions. This is why we offer you to experience Calçotada menu during our day trips from Barcelona in winter season. Calçotada lunch in a great traditional countryside tavern can become a highlight of a wine tour or a trip to Montserrat or Sitges.